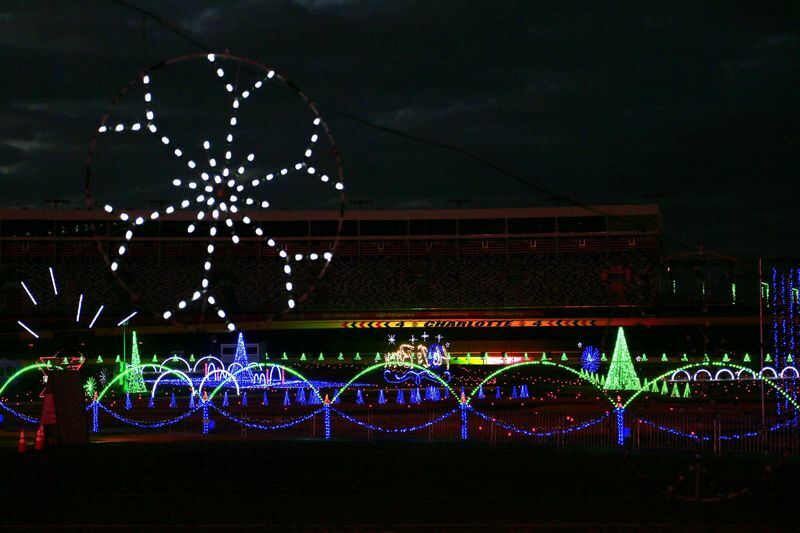 Fans are packing into Speedway Christmas, Charlotte Motor Speedway's annual family-friendly showcase of lights, for an unforgettable dose of Christmas cheer throughout the iconic superspeedway. To accommodate the growing crowd, the expansive infield Christmas village will be open nightly through Christmas Eve, while the light show runs through Dec. 31. The show opens from 6 p.m. to 10 p.m. and is closed Christmas Day. The last chance for children to turn in their Christmas list and get photos with Santa before he heads to the North Pole is Dec. 24. The Ice Princess will be available for photos nightly through Dec. 31, except for Christmas Day. PLEASE NOTE: Fans are encouraged to visit Speedway Christmas on weeknights or Sunday evenings for smoother traffic flow and to reduce wait times. Friday and Saturday are the busiest nights for Speedway Christmas, and fans are encouraged to arrive early by 5:45 p.m. if visiting on those nights. PHOTOS WITH SANTA AND ICE PRINCESS: Children can get their pictures taken with Santa from now until Dec. 24 in the Christmas village. Additionally, children can meet a real Ice Princess and get a picture with her through Dec. 31. FOX 46 MOVIE NIGHTS: Classic Christmas drive-in movies start at 6:30 p.m. on the 16,000 square-foot Speedway TV. "The Polar Express" plays through Dec. 24, and Disney's "Frozen" will show Dec. 28-30. Movie admission is free with each car pass. BETHLEHEM VILLAGE AND PETTING ZOO: Families can enjoy a large petting zoo with llamas, a donkey, ponies, goats and cows. Animals will also join volunteer actors to bring the Christmas story to life in a living Bethlehem nativity scene. HORSE-DRAWN WAGON RIDES: Few things encapsulate the holiday spirit like a horse-drawn wagon ride, and the Charlotte Motor Speedway version takes fans through the lights encircling the infield Christmas village. Vehicle passes start at just $25 and include the drive-through light show, FOX 46 Movie Nights and access to the infield Christmas village. Passes can be obtained at the gates or in advance by calling 1-800-455-FANS (3267), or visiting www.charlottemotorspeedway.com. "Express Lane" passes are available for an additional $10 that puts cars in a shorter line to the light show.